The passenger compartment remained stable during the frontal impact. Dummy readings suggested that the head of the driver had 'bottomed-out' the airbag. Without the penalty applied for this, the driver would have scored maximum points for all body regions. The knees and femurs of both the driver and passenger were well protected during the test. Mitsubishi showed that the same level of protection would be offered to occupants of different sizes or those sat in different positions. In the side barrier impact, protection was rated as good for all parts of the body. However, although it did not open, the driver's door became unlatched and the car was penalised. In the side pole test, protection of the chest was rated as weak owing to the extent of rib deflection, and protection of the abdomen was marginal. The protection offered against whiplash injury was also rated as marginal. Based on dummy readings alone, the car scored maximum points for protection of the 3 year old in the front and side tests. The passenger airbag can be disabled to allow a rearward-facing child restraint to be used in that seating position. However, information provided to the driver regarding the status of the airbag is not sufficiently clear. The presence of ISOFIX anchorages in the rear outboard seats was not clearly marked. No points were awarded for the protection offered by the front edge of the bonnet to pedestrians' legs. The bonnet provided poor protection in most of the areas likely to hit by an adult's head. As a result of Euro NCAP's new rating scheme, Mitusbishi have made electronic stability control more widely available. 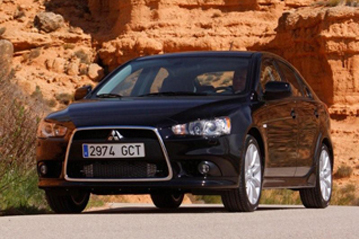 From the middle of February 2009, Mitsubishi Active Stability and Traction Control (MASTC) is available as standard on most Lancer variants and as an option on all others throughout Europe. Consumers should be aware that some cars in stock may not be equipped with MASTC and Euro NCAP encourages them to choose those which are. A seatbelt reminder system for the driver and passenger seats is standard equipment.